Daily Drinker is an unusual retailer in many ways. 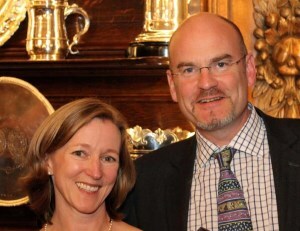 The company is run by husband and wife team Caspar and Victoria Bowes, who have run wine business together since 2002, though Caspar has been involved in high-end wine business since 1983, still with private clients around the world. What makes Daily Drinker unusual is both the set-up of the business, which is run primarily as a club (though anyone can buy), but also Caspar’s honesty and his motivation for the wines he sells. For most he films a short and very frank video review, not always glowing with compliments, but full of information and his honest reaction to the wine he is selling. And he chooses some really interesting wines. Anyone can buy wines from thedailydrinker.com, just like any other online retailer. But the essence of the site is its membership club, which has three levels, Gold, Silver and Bronze. Gold members receive 24 different wines per year, choosing two bottle per month or six bottles per quarter. Silver members receive 12 bottles per year and Bronze members six. On the day the wines are despatched an email is sent containing links to Caspar’s tasting notes, plus detailed information. All members enjoy a 10% discount when ordering any wines from the online shop, so if you like a wine you have the chance to buy more. You can read more and sign-up at thedailydrinker.co.uk. 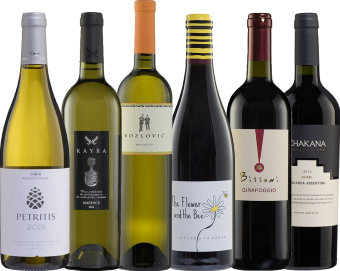 I’ve recently sampled six wines from Daily Drinker’s selection, which I found to be of really excellent quality, but more than that, to accurately reflect their ethos of potentially expanding the wine drinkers’ horizons. (2016) On a visit to Croatia a few years ago I was very impressed by a number of wines made from this Istrian version of Malvasia. Unoaked and dazzlingly fresh, this is all about cool, salt-licked mineral, citrus and taut apple freshness, medium-bodied and quite delicate, and yet there's a steeliness and a concentration about it, a sense of grip and a little spice too, making it very gastronomic. (2016) The Narince grape is another Turkish native, one of whose parents is the Kalecik Karasi. This pours a pale straw/gold, with a creamy, oaty character on the nose, quite full (with a touch of oak?) and plenty of fat, waxy lemon peel character. That hint of fruit skin grippiness comes through in the mouth, in a wine with plenty of cool, shimmering acidity, but real fat and texture to the mid-palate flavours. Interesting and good. (2016) What a treat to find this wine in the UK thanks to Daily Drinker: I've judged the Cyprus National Wine Awards three times now, most recently in 2016, and have visited these phenomenal vineyards at 1500 metres altitude which they claim to be Europe's highest. I have also tasted a vertical of this wine back to the 2002, proving it ages well. It's a serious, Chablis-style wine made from the native Xinisteri and gently touched by oak. Shimmering and bright, there is vanilla and oatmeal over ultra-fresh citrus and apple, a little salty mineral note too. All of that combines on the palate rather beautifully: its not flashy or outgoing, but has a winning balance of fruit and nervous energy, and a long, mineral finish. (2016) A gentle, very nicely approachable wine, this is Sangiovese from Emilia-Romanga, and a fine expression of Sangiovese at its most Pinot-like, all tobacco and cherry, a touch of light gaminess, and mellow to the core. In the mouth it is medium-bodied and fresh, so nicely walking the line between sweet fruit openess and really quite a tight structural framework. (2016) I visited Chakana at the start of this year and was impressed by their organically grown wines. This is Bonarda, quite common in Argentina, from vineyards at 960 metres altitude, and made here with some oak ageing. The nose has bacon fat and smokiness, mellow mulberry and dark plummy fruit, quite gamy and deep but there is a Sandalwood note of lifted fragrance. In the mouth it is full and rich, a nice sweet/sour balance from the fruit and grippy acidity and tannins, the oak adding a little tobacco and cedar layer to the finish. (2016) From Galicia in cool, Atlantic-influenced northwestern Spain, this is a bold red wine made from the local Sousón variety, AKA the Sousão of the Douro and Vinhão of red Vinho Verde. Deep and rich in colour, it has a black/blue fruit intensity, damson, blueberry and black plum, a touch of clove and a whisper of iodine and leather. Filling the mouth, it has plushness and depth, but there's a peppery, lean streak of acidity that can only be found in cooler climates, giving this freshness and a certain tartness and crunch that gives a wonderfully moreish, gastronomic character too. Terrific stuff, and note that Daily Drinker members can buy with 10% off. Watch the video for more information and food-matching ideas.